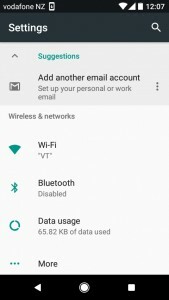 Ferret WiFi – I can’t connect to the WiFi or it won’t stay connected on my Android. A small number of Androids get a little confused when first connecting to the Ferret WiFi hotspot. They don’t understand why you would want to connect to a WiFi hotspot without Internet. Fair call but the Ferret WiFi wants to give you a HD streaming picture, not help with your web searching…. Some Androids also get a little angry due to the WiFi connection not being secure. 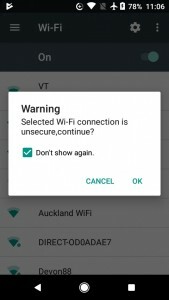 This is not a security issue and it’s an easy fix – just check a box as shown below and tell your Android it’s OK.
Ferret WiFi – I can connected my Android to the Ferret camera but can’t get an image. If the Android phone’s WiFi is connecting OK to Ferret camera, a very small number of Android phones decide to try and use 3G/4G to connect to the Ferret camera due to not finding the Internet on the WiFi connection. 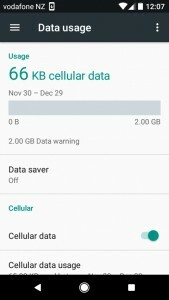 On your Android device, go to Settings -> Data usage -> Cellular data usage and scroll down to find and select the Ferret WiFi App. 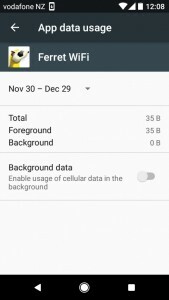 Turn off Background data to resolve the issue. 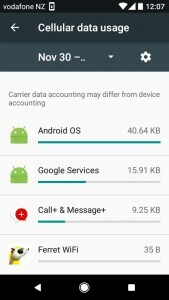 Ferret WiFi – How can I get the App? Search on either the Google App Store or Apple Store for “Ferret WiFi” and you should find the free app. When you install, make sure you give the app access to the smart devices photo gallery. Ferret WiFi – Can I turn the camera LEDs off? Yes. In the app you can turn off the LEDs completely, have them half brightness or have them full brightness. 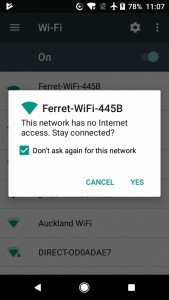 Ferret WiFi – Is it bluetooth? The Ferret WiFi is not bluetooth – it’s WiFi. The Ferret WiFi camera has its own WiFi hotspot. Just turn on the camera and wait a few seconds for it to boot then once the camera LEDs are on, search in the WiFi section on your smart device. If you can’t get your smart phone to connect to the Ferret WiFi camera, check for other phones linking to it. Only 1 smart phone can connect to Ferret WiFi camera at once. If you have linked the camera to several phones, one of the other phones could have automatically linked to the camera even though the App is not running. Smart phones often auto link to a known WiFi. The range will vary depending on objects between the camera and display as well as electrical and wireless interference. It will also reduce when the camera battery is getting low. Ferret Pro – Can I turn the camera LEDs off? No. The LEDs are always on when the camera is turned on. The display battery is low. A recharge is required. The blue screen indicates that there is no camera image being received. Ensure the camera is charged and turned on. When on the bright white LEDs are turned on. Ferret Pro – How do I know if the camera or display is fully charged? Once fully charged the red charge indicator LED on the back of the camera or on the front lower right of the display will turn off.